(Press Unit in the Office of the Press Unit) – Prime Minister Dr. the Honourable Timothy Harris met with the employees of the Human Resource Management Department of the Government of St. Kitts and Nevis to outline clearly his expectations of that department and also to help boost the employees’ morale. The meeting, held on July 13 in the Parliamentary Lounge, gave the honourable prime minister the opportunity to directly address the men and women he referred to as the “gatekeepers” of the public service and also gave the staff members the rare opportunity to address their views and concerns directly to the leader of the country. In addressing the employees, Prime Minister Harris impressed upon them the importance of the Human Resource Management Department to the proper functioning of the St. Kitts-Nevis Government. Dr. Harris went further by encouraging the staff members of that department to continue to exert their very efforts in carrying out their roles and responsibilities on a daily basis. “Your best efforts could be as simple as coming to work early. Doing the best we can today may mean that you have to work an extra hour to get the job done to ensure, for example, that the teachers who come on in September would really be able to get paid at month’s end,” Prime Minister Harris added. Following the prime minister’s presentation, staff members were given the opportunity to express their views and concerns during a question and answer session. 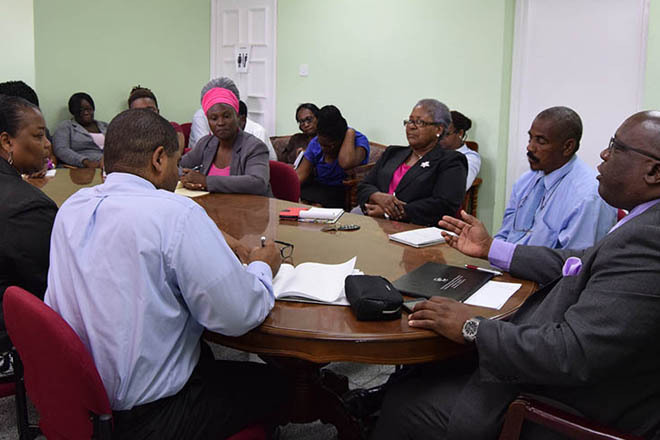 The staff meeting was also attended by Cabinet Secretary, Mrs. Josephine Huggins, Permanent Secretaries in the Office of the Prime Minister, Mr. Andrew Skerritt and Mr. Osbert DeSuza and the Chief Personnel Officer, Ms. Torfrida Rochester.